Lucille Giffone's New Book 'Natural Wonders' is a Wonderful Opus That Allows Children to Wander and Observe the Mysteries of the Natural World. 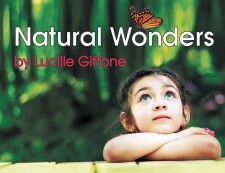 Recent release "Natural Wonders" from Covenant Books author Lucille Giffone is an endearing children's book filled with imagination and fun as kids witness the beauty of Mother Nature. WASHINGTON, Mo., November 8, 2018	(Newswire.com) - has completed her new book, “Natural Wonders”: an enchanting narrative that inspires children with an appreciation for nature and its phenomena. Published by Covenant Books of Murrells Inlet, South Carolina, Lucille Giffone’s new book is perfect for teaching children simple yet deep thoughts and perspective that stimulate their imagination and senses. “Natural Wonders” is full of wandering and observation. In this book, children wonder about many aspects of nature. This book is most suited for ages four to eight years old. This is Lucille Giffone’s second children’s book published by Covenant Books. Her first book is titled “I am a part of all nature”. Readers can purchase “Natural Wonders” at bookstores everywhere, or online at the Apple iTunes store, Amazon, or Barnes and Noble. Covenant Books is an international Christian-owned-and-operated publishing house based in Murrells Inlet, South Carolina. Covenant Books specializes in all genres of work which appeal to the Christian market. For additional information or media inquiries, contact Covenant Books at 843-507-8373. The recent publication "Effective Ministry to Orphans" by Dr. Larry E. Banta, published by Covenant Books, is a manual that shows how to effectively minister to orphans and adopted children to achieve a good coexistence. Recent release 'Count the Blessings' from Covenant Books author Alvin Trusty is a cheerful series of uplifting essays that draws spiritual insights from the author's life as he reflects on the countless opportunities to be grateful. Recent release 'Re_Essence' from Covenant Books author Jenna Underwood is a gripping science fiction novel that explores the impact of trauma and the body's life-saving response to it, leaving a troubled EMT volunteer and a young girl with a fighting chance at recovery from their respective suffering.